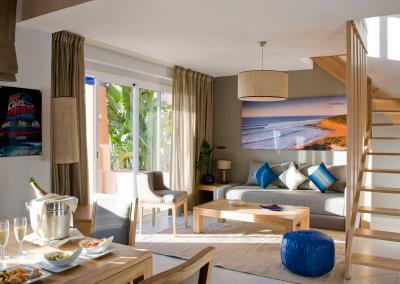 Lock in a great price for Paradis Plage Surf Yoga & Spa – rated 8.9 by recent guests! 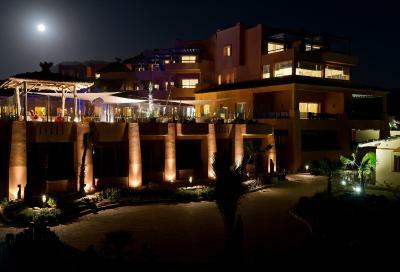 Lovely hotel, good food, especially the fresh grilled fish st the restaurant by the sea. 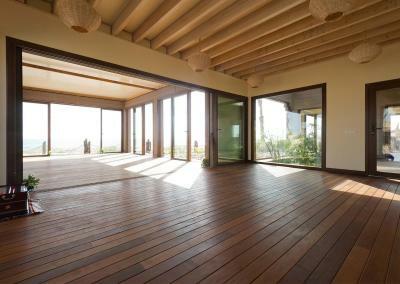 Excellent surfing classes and beautiful yoga facilities. The outside pool is not heated but gets warm enough in the sun - a lovely swim. 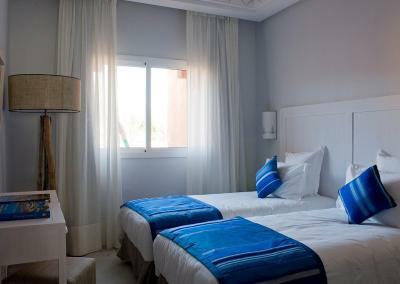 Beautiful views, clean rooms and friendly staff. 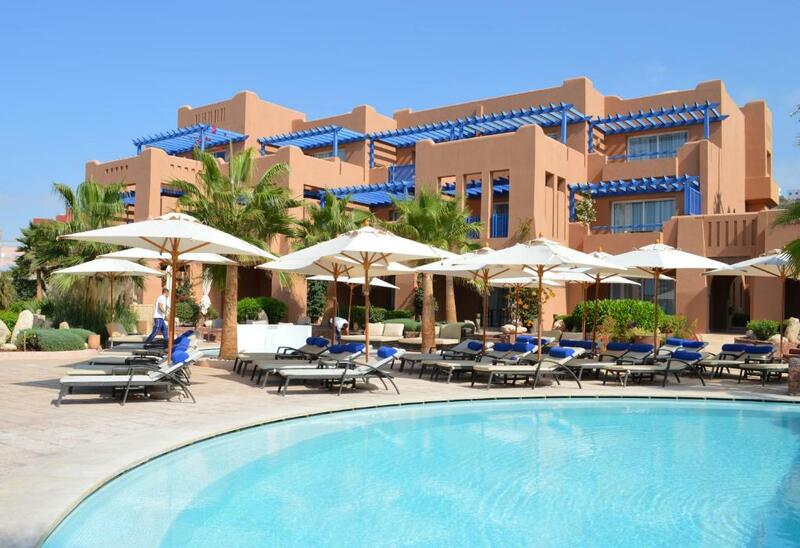 This place is the perfect place for an active and relaxing holiday. 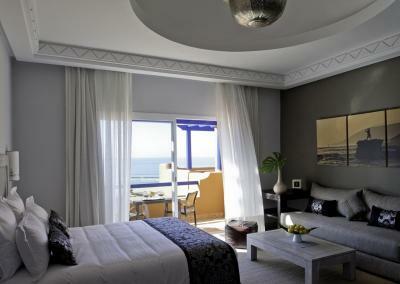 The location right by the beach is beautiful and the ambience of the hotel is pure bliss. Going for a jog on the beach, waking up with morning yoga or enjoying a session in the indoor+ outdoor gym, trying out the waves or just hanging out by the pool all day- there was something to keep all our six family members happy during our stay. Exactly what we were looking for. A place to recharge and relax. The beach cannot be better located. The breakfast is wonderful, rich, has something for everyone and delicious. The rooms are extremely spacious and fun to hang out in. The gym and other facilities are extremely convenient. Highly recommend for anyone looking to relax. Lovely staff. Especially Erica who was so welcoming and went above and beyond to make us feel at home. Erica manages the place with such professionalism and will be efficient with tending to any issue that might come up. Just keep in mind. Without a car you won’t have much mobility. Just a couple of restaurants and shops around which is actually quite nice if you want to wind down from a long travel. 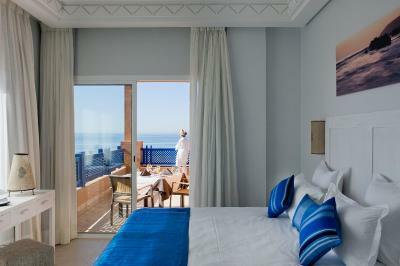 (check out Quartier d’ete).Taghazout is 10 min via taxi. Very nice stuff, always ready to help. Front desk are doing a great job in making your stay enjoyable. We had a fantastic sea view terrace. The staff was nice to the animals and treated the cats nicely. Great beach, but could be cleaner. Unique property with direct access to the beach. It was not even a 2 min walk from our room. 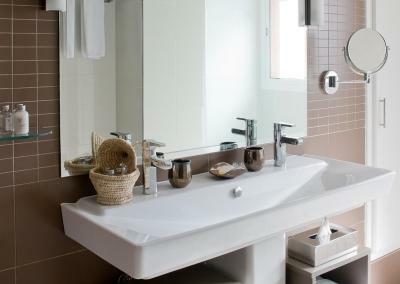 Amazing amenities where everything is made for you to relax. Super friendly and efficient staff who make their best to satisfy their guests! Very good location outside the city in a calm area, yet few restaurants and shops nearby. Interesting array of activities proposed onsite (Yoga, Surf, etc). 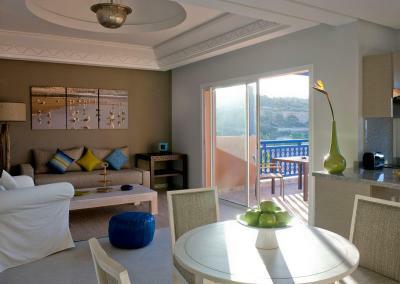 We had the premium suite, very appropriate for families, with a kitchenette, dining table, and terrace with sea view. The rooms are amazing but the staff is even better!! 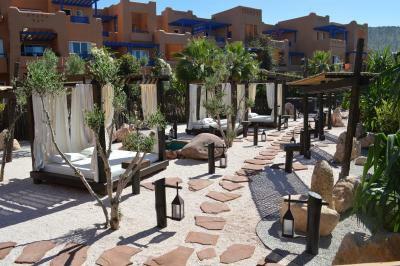 Paradis Plage Surf Yoga & Spa This rating is a reflection of how the property compares to the industry standard when it comes to price, facilities and services available. It's based on a self-evaluation by the property. Use this rating to help choose your stay! 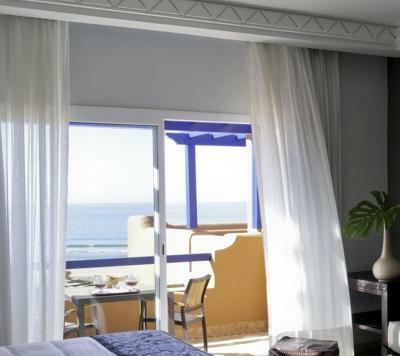 One of our top picks in Taghazout.Set in a 3-hectare oasis in front of the Atlantic Ocean, this resort has direct access to the beach and features a spa and beauty center, an outdoor swimming pool and 4 restaurants. Free Wi-Fi is available throughout. 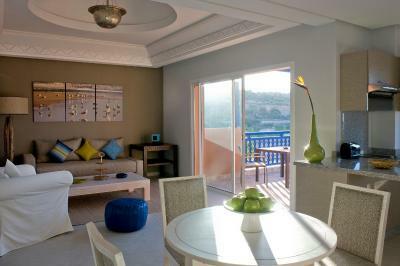 With a large terrace looking on the garden or the sea, rooms at Paradis Plage have a modern décor with a Moroccan touch. 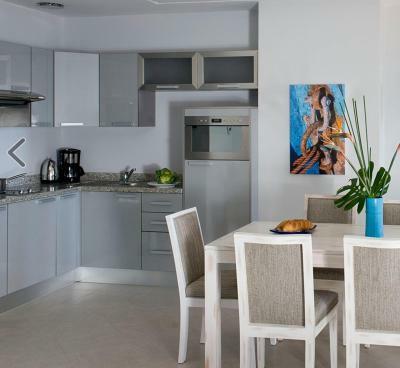 They include an equipped kitchen, a bathroom, and a dining and seating area. A continental and American buffet-style breakfast is served daily. 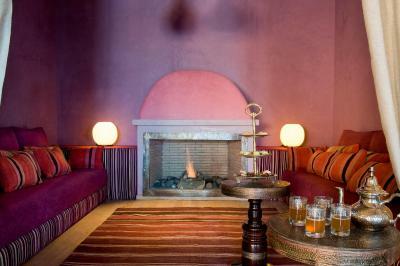 The restaurant proposes an organic and healthy cuisine with Moroccan and international specialties. 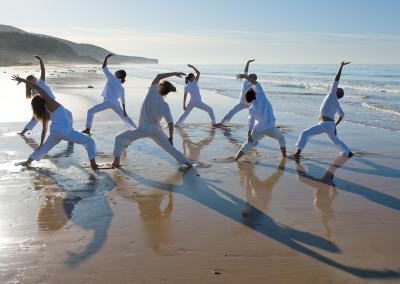 Surf, stand up paddle and yoga are only some of the activities offered by Paradis Plage. 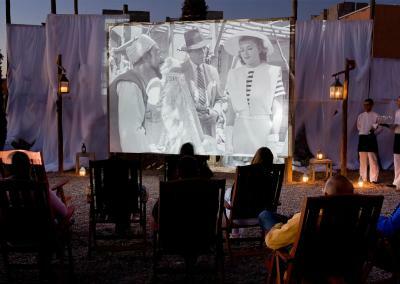 There is also an outdoor cinema with a projection every night, and a zen garden with hot tub and hamacs. 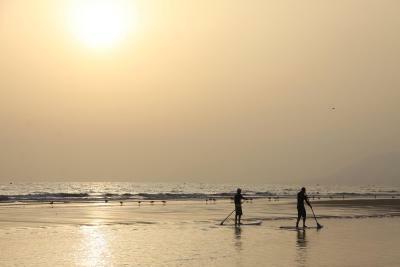 The kids club organizes beach games and cinema sessions on the beach for children. 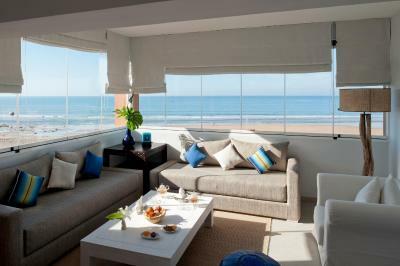 Agadir Airport is 50 minutes' drive away and the city center is a 25-minute drive. Essaouira city center is 93 mi away. 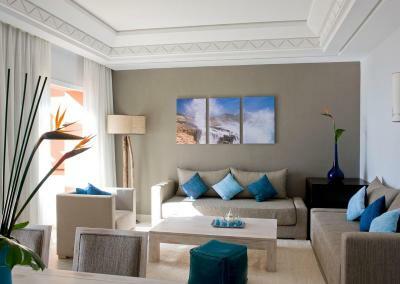 When would you like to stay at Paradis Plage Surf Yoga & Spa? 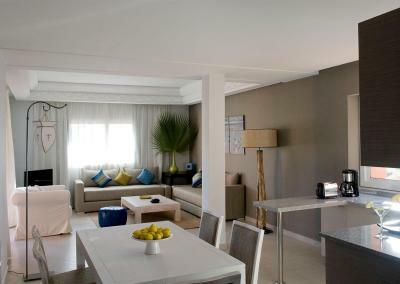 - a sitting area with DVD player and flat-screen TV with satellite channels. Paradis Plage is the unique Surf Yoga and Spa Resort in Morocco, located in the region of Agadir, near to the surfer's village of Taghazout, in the middle of the most famous blips of surfing in Morocco. Feet in the water, edged with a beach 5 km long and leaned on a hilly region, Paradis Plage is the witness of a rich natural heritage and a traditional way of life in the numerous facets. 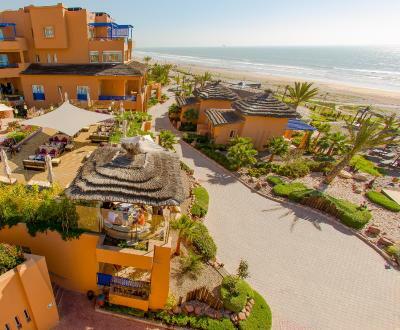 Far from Agadir's tourist inflow and in the middle of a real 3 hectare oasis facing up the Atlantic Ocean, Paradis Plage is a beautiful and undisturbed piece of land without stress. As the concerns for health, both physically and mentally are increasing tremendously, people are looking for a sanctuary where they can leave all their responsibilities behind. 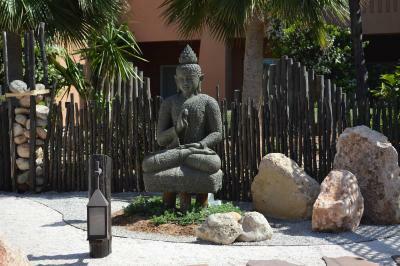 At Paradis Plage Surf, Yoga & Spa Resort, this important point is taken into consideration and we put in every effort to create an environment that will enable you to 'Liberate Your Senses'. House Rules Paradis Plage Surf Yoga & Spa takes special requests – add in the next step! Paradis Plage Surf Yoga &amp; Spa accepts these cards and reserves the right to temporarily hold an amount prior to arrival. Paradis Plage Surf Yoga & Spa accepts these cards and reserves the right to temporarily hold an amount prior to arrival. Please note that the Gala dinner for New year's eve is mandatory and is not included. 1400 MAD/adult and 700 MAD/child. The hotel is absolutely beautiful, super clean and in great conditions. 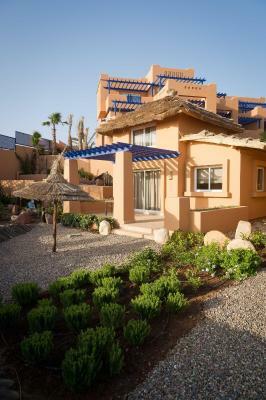 It offers whatever you need to enjoy a great holiday, either if you want adventure, to learn to surf or relax at the beach, at the pool or at the Spa, it has a great atmosphere. The people working there are very committed to their job, always happy to help and share with you tips or to explain you much more about their culture and country, all the great experience is because of them! All the restaurants serve delicious food with high quality products, you always find many options either if you are vegetarian or vegan. Breakfast is amazing, you get fresh fruits, tee, coffee, many variations of breads, pancakes, cakes, etc. You have the option to get fresh omelets and juices. I would definitely come back again! I highly recommend it, good for anyone, group of friends, couples or families! Food was too expensive. You're better off eating outside of the hotel. From the very beginning this was the perfect place for us. 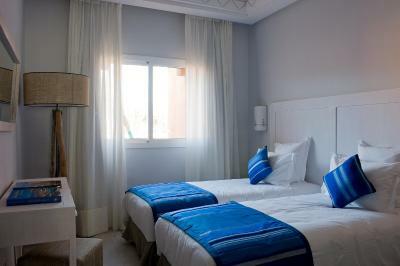 Very friendly staff, clean place, playgrounds for little children, located next to the beach. We highly recommend this place to families with small children, you will not be disappointed. The breakfast provided was great. The staff really helpful and nice. The location is amazing and it's just really comfy and chilled. Breakfast could be much better. Beverages, álcool, food etc is really expensive. The beach is not adapted to beginner surfers - you spend more time fighting the sea than surfing. Beach can be rocky at times. 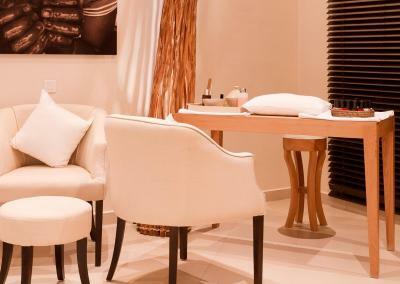 The spa manager tried to refuse service “for my own good” because I am a breast cancer survivor. I found that incredibly disrespectful and inappropriate. Be sure to keep that in mind if you are in the same boat when going there. Spa staff and service was lovely though. We had ordered a transfer but due to miscommunication, no car was waiting for us when we arrived - be sure to confirm your order before traveling! Expensive for excursions and taxis to places. Food was expensive. The only negative was the spa,50 minute massage lasted for 30 minutes then the rest was nap time, it was quite expensive. It was very good but very expensive for half an hour. We were in a couple room, can be more professional with less whispering. Internet could be better. Sangria was terrible! 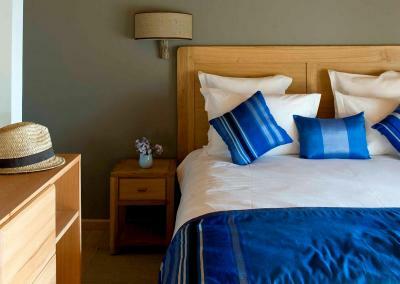 Perfect hotel with beautiful arrangement and great service. Best breakfast. Breakfast can be a bit manic if you go down at the busy time, lovely food but had to keep searching for cutlery and bowls etc, coffee machines slow and kept breaking down. 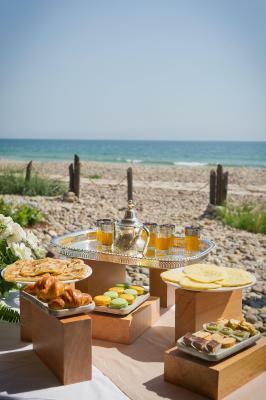 Table service for tea and coffee would have been a nicer touch and more elegant solution. A little more atmosphere could be added to the buffet dining room in the evening, lower the lighting a little, add some candles, same for the restaurant 27, lovely food, attentive staff but lacking a little atmosphere. It would also be nice if they lit the fires in the little dens in main bar area, horse would make cosy retreats in the evening. Being picky it would be nice to have been able to have a mug rather than the tiny tea cups, and it would be nice to have some local Moroccan plates and bowls rather than the plastic canteen style. This is a great hotel above points are really just little things that we felt would take the hotel from a good to a great place to stay. 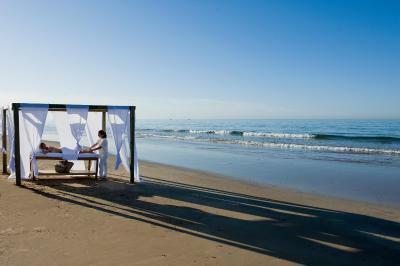 Great location on a stunning beach, nice food and friendly staff. Very clean. Sunsets at the camp fire bar are beautiful. Quality linens. Turn down service. Daily bottled water. Welcome drink. Breakfast buffet. Friendly staff. Gardens. Beach right there. Variety of facilities. All gorgeously done.